Use these ideas to improve your eggplant crop productivity using trellis netting as crop support. 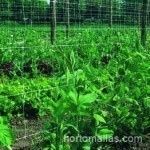 The great advantage of using HORTOMALLAS trellis netting for your tutoring of solonaceae plants is an improved phytosanitary conditions, thanks to improved aeration and decreased contact with the workers hand, as these are a vector for disease transmission and mechanical stress. The installation of a trellising system using the “double netting” method or a V shape or even the horizontal support offers great visible and immediate advantages such as reduced labor requirements for tutoring the plant fastening it with twist ties or clips, and that is an immediate saving! The advantages of a double netting system do not end in the labor cost reductions: the hidden and perhaps more important results come from the reduction of the rate of virus disease transmission! Fito viruses in eggplant are transmitted by aphids most of the time, but many times and too commonly horticulture workers will be themselves the vectors of transmission when working among plants and touching each plant especially when placing a tutoring clip or fastening the plant to the raffia cable. Diseases are also brought and spread to plants from the simple act of a workers handling the tobacco from a cigarette! Given these facts, avoiding as much as possible physical contact between a worker and the plants becomes of the utmost importance, so a system that allows the plant to self-tutor without the intervention of the hands of workers (which in most cases happens exactly when the plant is in its development stage) will have clear cultural advantages that turn into greater plant yield and reduced used of chemicals. A netting system that “catches” the plant on both sides, sandwiching it and allowing it to grow thru the meshes that will then act as supports, reduces by a great deal transmission and spreading of pathogens. This is how HORTOMALLASMR; contributes to an improved phytosanitary condition and a reduction of the costs and quantity of spraying!